Crowe Lake is accessible via a short, easy 200 m portage from the NE end of Portage Lake, just a couple minutes from camp. An aluminum boat is cached at Crowe Lake for your convenience, but if you want an outboard motor, it must be carried in. Also take in a paddle, boat cushions / PFDs, fuel and snacks. A small lake, Crowe Lake can easily be explored and fished in a half day, leaving plenty of time for other pursuits or another side trip to nearby Finney Lake – just over a rocky ridge which separates the two. 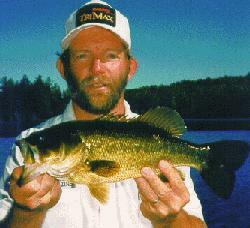 Crowe Lake offers only largemouth bass, but the fishing is exceptional, with most fish in the 1 to 2-pound range. However, the occasional “hawg” topping four pounds is caught here. There is little in the way of cover on Crowe Lake except for a ribbon of “dollar pads” that ring the shoreline. These stretches of weeds always hold bass and fishing a plastic worm and/or spinnerbait is the best approach. At the extreme end of the lake, a shallow, weedy area with a sandbar / weedline / breakline combination is a hotspot. A few shoreline stretches have isolated blowdowns and these should always be fished thoroughly with a plastic worm.